You know how some folks like to decorate their work area with something that inspires them, or boosts their morale? If you have answered in the affirmative, and happen to be in employment of the Galactic Empire, then chances are you will have your brothers in arms in your mind most of the time, and the $19.99 Stormtrooper USB Car Charger would definitely make sure that you do your darndest best to get back alive from any mission which you have been dispatched to handle. Do not underestimate the power of the consumerism and all things Star Wars, that is for sure. The Stormtrooper USB Car Charger, as its name suggests, can be plugged into your 12V vehicle power adapter (cigarette lighter, if you will), and it will play nice with just about anything that juices up via USB. You will not be able to find the Stormtrooper USB Car Charger anywhere else, since this is a ThinkGeek creation and exclusive, which will appeal to Star Wars loving folks as much as this Flux Capacitor USB Car Charger makes Back to the Future fans wet their pants. 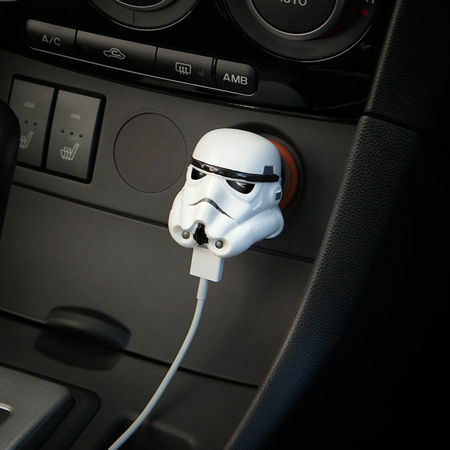 The Stormtrooper USB Car Charger delivers 2.1 Amps of juice, and there is also a flexible arm that pivots up and down in order to help you better customize it to best fit your vehicle’s power socket placement.